Its only a mile or so from Cromwell Lock to Newark Nether Lock. I wasn’t in a hurry and whilst downing my second cup of tea I had a visit from Les the lock keeper. 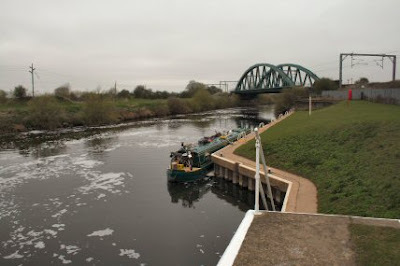 The lock at Newark was having a problem with one of the paddles and there was a possibility of a delay. There is only one thing to do in response to this sort of thing – put the kettle on and have another cup of tea. Les has lived on his boat Country Rose for a number of years alongside which I was moored next to last night. He would like to get a bigger one but over the years has become so attached to it that he can’t bear to part with it. I left the boat on tick over as I travelled slowly giving as much time as possible to finish the repair before I arrived. 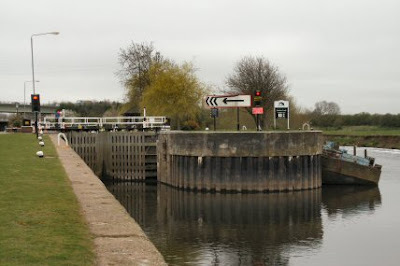 Nether Lock is on the left and has a water source coming head on as you approach. I don’t know where the source comes from but it looks as though they used too much soap. Actually it is the overflow from the canal. A good mooring but unyielding and very solid if you get the approach wrong. The lock was working again by the time I arrived and the keepers were busy putting finishing touches to paintwork. There must be some rivalry between the locks as to the Best Kept Lock Competition. On the way to the lock I had one of those moments when you wonder what the morons that dump the fridges etc into the rivers and canals are thinking of. I passed three and the ever present tyres and gas bottles. Apart from those the banks are quite clear till one reaches the outskirts of Newark and the rebuilding and demolition work. Newark has changed a lot since the last time I was here. 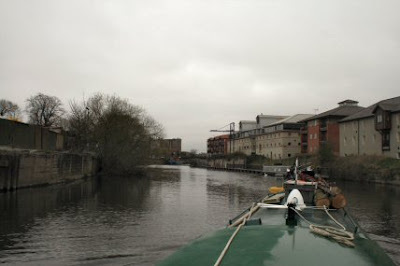 Loads of new buildings and moorings along the canal. Just the place to stop if you want a run ashore with all the amenities near at hand. I am moored just short of the castle and two minutes from the centre and three supermarkets. This might be a quiet mooring at night but if you fancy a snooze during the day then beware. Across the canal from here is a scrapyard and today they were moving the metal about. Noisy! !